The Kuvasz is one of two Hungarian livestock guardians, the other being the Komondor. Livestock guardians do not herd their charges, but instead protect them. Komodorok traditionally guarded both sheep and cattle, living with their charges and fending off predators that included bears and wolves. Young dogs are reared with their livestock to create an attachment that will cause them to give their own lives if necessary. The Kuvasz has been protecting sheep in Hungary since ancient times from predators and thieves. Their name may be derived from the Turkish word ‘Kawasz’, meaning ‘armed guard’ or possibly ‘Ku-assa’, ‘horse-dog’ in ancient Sumarian. It is believed their ancestors either came with the Maygars or accompanied Turkish shepherds in the 12th or 13th century. It is known to have been established by the 15th century, as it was a favorite of King Matthias Cornivus. During that period they became highly prized, given to visiting dignitaries as royal gifts and he used them to hunt boar and other prey. They were nearly wiped out after WWII, but survived in isolated areas. Some sources state that as few as twelve dogs survived and it took dedicated breeding to revive the Kuvasz. It has also been suggested that other related breeds were added in order to strengthen the line. 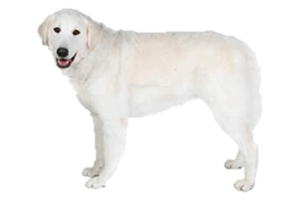 Although the Great Pyrenees is most often mentioned they are also related to other European livestock guardians such as the Slovakian Shepherd Dog, Tatra Mountain Dog, and Maremma Sheepdog.